Transfer in HK stock to earn up to HK$3,000 cash coupon rewards. 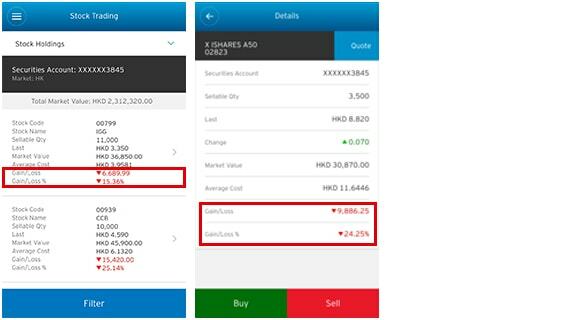 Citi has enhanced its Citi Mobile® App by upgrading the features on its mobile stock trading platform, offering a more intuitive interface and simplified navigation so that you can enjoy the experience of your phone becoming your bank on the move. 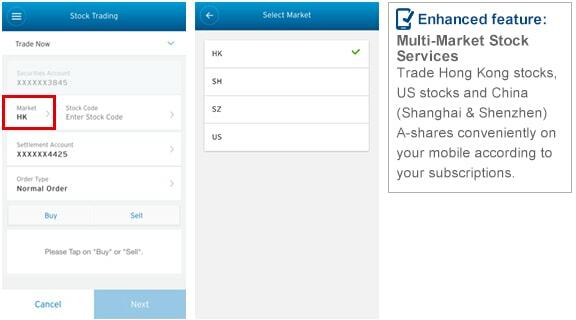 Citi proudly presents the upgraded Stock Trading Platform via Citi Mobile® App and a range of stock fee waivers. 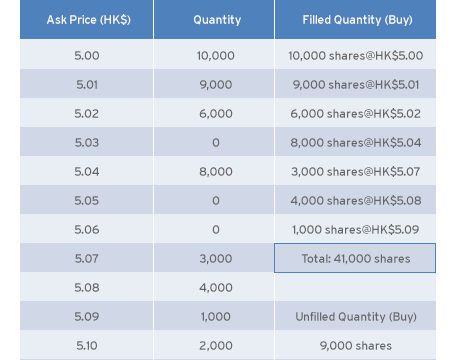 from the 4th month Non-payroll account clients can enjoy the continuous HK stock buy fee waiver from the 4th month if there is at least 1 HK stock buy/sell transaction every month continuously. The "Payroll for continuous stock fee waiver" offer is applicable to HK stock buy transactions only. 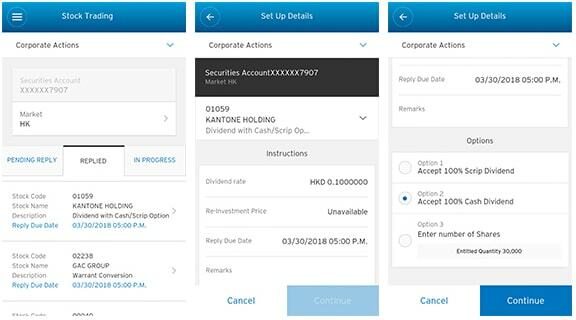 Starting from the 4th calendar month of securities account opening, clients have to deposit a monthly salary of HK$15,000 or above into a Citibank payroll account named Step-Up Interest Account via the auto payroll service or standing instructions ("Successful Payroll Deposit") to enjoy the offer. If there is no record of Successful Payroll Deposit or if the payroll account is cancelled in any single month from the 4th calendar month onwards, the offer will be terminated in that month and cannot be resumed. The "Up to a lifetime fee waiver on stock purchases" offer is applicable to HK stock buy transactions only. Clients must have at least one Hong Kong stock buy or sell transaction ("Eligible Transaction") within the first 3 calendar months of securities account opening to continue enjoying the HK stock buy fee waiver in the 4th calendar month. Starting from the 4th month, the fee waiver will continue if clients perform at least one Eligible Transaction in each calendar month thereafter. If there is no Eligible Transaction within the first 3 calendar months of securities account opening, the offer will be terminated in the 4th month and cannot be resumed. If there is no Eligible Transaction in any month starting from the 4th month, the offer will be terminated in the following month and cannot be resumed. Only applicable to Citigold Private Clients®, Citigold® services clients, Citi Priority® clients and Citibanking® Citi At Work payroll clients who conduct HK securities transactions via Internet or Mobile Securities Service. For a holistic projection on your investments. Allow easy control over your stocks. Whether you're dealing with cash or dividend, it can be managed instantly and easily on your phone. A normal order is an enhanced limit order that allows you to set a maximum price for a buy order or a minimum price for a sell order as the order price. An input control mechanism is put in place to ensure that the order price is not set too far away from the current market price when the order is placed, such that (a) the order price for a buy order shall be set within the range of 19 spreads higher than and 100 spreads lower than that current bid price; or (b) the order price for a sell order shall be set within the range of 19 spreads lower than and 100 spreads higher than that current ask price. Any unfilled portion of a normal order will be queued for matching until the relevant order expiration date. Generally, placing a normal order does not guarantee its execution even when the market price reaches your set order price if other orders may have been queued ahead of yours. An At-auction Limit Order (Pre-opening Session) is a limit order which you may place with the Stock Exchange of Hong Kong for processing during the pre-opening session (9:00 a.m. - 9:30 a.m.) on any relevant Hong Kong trading day. It usually enjoys a lower auction matching priority than an at-auction order. Any filled at-auction limit order (in whole or in part) will be executed at the final traded price of the pre-opening session (i.e. the final Indicative Equilibrium Price (IEP)). If any pre-opening session is not available for whatever reason or when it closes on any Hong Kong trading day, any unfilled at-auction limit order (in whole or in part) queued in the exchange with an input price not deviating nine times or more from the final traded price of the pre-opening session, (i.e., the final Indicative Equilibrium Price (IEP)) will be converted to a limit order at 9:30 a.m. at the same input price and carried forward to the continuous trading session (9:30 a.m.-12:00noon; 1:00p.m.- 4:00 p.m.) on that same trading day for processing. Good-Till-Date (GTD) feature is supported for at-auction limit order (pre-opening session). Within the good-till-date of a single good-till-date order, all the portion(s) thereof filled on any trading day shall be aggregated as one single order for that trading day for the purpose of calculating the fees and charges based on the normal fees and charges schedule and the executed price on that trading day. Order type cannot be amended via order modification function. If you wants to change the order type (from at-auction order to at-auction limit orders, or vice versa), you will need to cancel the original order and input a new order of another order type. any new order may be placed after market closed (Random closing period 4:08-4:10 p.m.) on the previous Hong Kong trading day until 9:15 a.m. during such session. 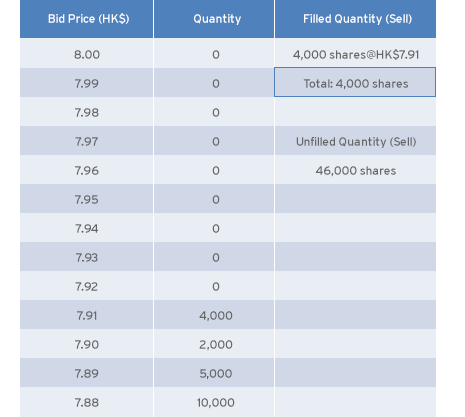 An At-auction Order (Pre-opening Session) is a market order (without a specified limit price) which you may place with the Stock Exchange of Hong Kong for processing during pre-opening session (9:00 a.m. - 9:30 a.m.) on any relevant Hong Kong trading day. 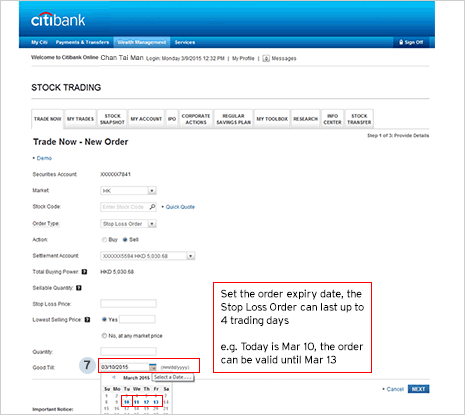 It usually enjoys a higher auction matching priority than an at-auction limit order and only sale instruction for such order is available at Citibank®. Any filled at-auction order (in whole or in part) will be executed at the final traded price of the pre-opening session (i.e. the final Indicative Equilibrium Price (IEP)). If any pre-opening session is not available for whatever reason or when it closes on any Hong Kong trading day, any unfilled at-auction order (in whole or in part) will lapse at 9:30 a.m. on that same trading day. any new order may be placed after market closed (Random closing period 4:08-4:10 p.m. ) on the previous Hong Kong trading day until 9:20 a.m. during such session. An at-auction limit order is an order with a specified price. An at-auction limit order with a specified price at or more competitive than the final IEP (i.e. closing price) (in case of buying, the specified price is equal to or higher than the closing price, or in case of selling, the specified price is equal to or lower than the closing price) may be matched at the closing price. An at-auction limit order may be matched in price and time priority at the closing price. No at-auction limit order will be matched at a price worse than its specified price. An At-auction Order (Closing Auction Session) is a market order (without a specified limit price) which you may place with the Stock Exchange of Hong Kong for processing during closing auction session (4:01 p.m. – end of random closing period) on any relevant Hong Kong trading day. 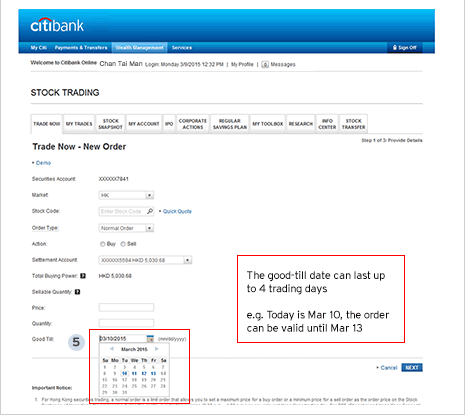 It usually enjoys a higher auction matching priority than an at-auction limit order and only sale instruction for such order is available at Citibank®. Any filled at-auction order (in whole or in part) will be executed at the securities’ closing price determined in the CAS. It enjoys a higher order matching priority than an at-auction limit order and will be matched in time priority at the closing price in the CAS. A two-stage price limit will be applied to control the price of limit orders which are either carried forward from the CTS to the CAS, or newly input during the CAS. In case only buy orders or only sell orders exist (or both do not exist) at the end of Order Input Period at 16:06, the price limit for No Cancellation Period and Random Closing Period will simply be set at ± 5% from reference price. How Does Stop Loss Order work? A stop loss order is a normal order that enables you to preset Stop Loss Price and Lowest Selling Price which you may place with the exchange for processing during the relevant trading session on any relevant trading day. For Hong Kong securities trading, the stop loss order is processed during the continuous trading session (9:30 a.m.-12:00noon; 1:00p.m.- 4:00 p.m.) on any relevant Hong Kong trading day. For U.S. securities trading, the stop loss order is processed during the trading hours on any relevant trading day. For Hong Kong securities trading, as the last traded price is used to determine if the Stop Loss Price has been triggered, the opening price of the continuous trading session may be adopted for the earliest triggering of a stop loss order placed on the relevant Hong Kong trading day. For U.S. securities trading, as the last traded price during trading hours is used to determine if the Stop Loss Price has been triggered, the opening price of the relevant trading session may be adopted for the earliest triggering of a stop loss order placed on the relevant trading day. Good-Till-Date (GTD) feature is available for stop loss limit order only and it allows you to select an expiration date (up to 4 trading days) until which such order shall be valid so long as the Stop Loss Price has not been triggered yet. Any un-triggered order will be cancelled at the market close on the expiration date. Stop Loss Price will only be triggered once during the Good-Till-Date period. Once it is triggered, sale instruction at the Lowest Selling Price will be placed with the Exchange until executed in whole in the Good-Till-Date. If you set the lowest selling price, once the order is triggered at the Stop Loss Price on any trading day, the sale instruction will be carried out at or above the Lowest Selling Price in the same way as a normal order except that any unfilled order (in whole or in part) will lapse at the end of the same trading day and will not be carried forward to the following trading day. Therefore, even if the Stop Loss Price has been triggered, the stop loss order may not be executed (in whole or in part). If you do not set the lowest selling price, once the order is triggered at the Stop Loss Price on any trading day, the sale instruction will be carried out in the same way as a market order at the current bid/ask price at the time when the order is triggered. 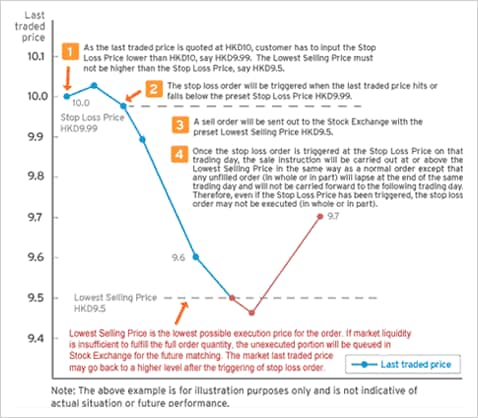 For Hong Kong securities trading, the Stop Loss Price must be at least 1 spread lower than the current bid price when the order is placed during trading hours (or the closing price when the order is placed since the market closes); and the Lowest Selling Price must not be lower than HKD0.01 and 100 spreads below the Stop Loss Price. For U.S. securities trading, the Stop Loss Price must be lower than the current bid price when the order is placed during trading hours (or the closing price when the order is placed since the market closes) and the Lowest Selling Price must not be lower than 95% of the Stop Loss Price. 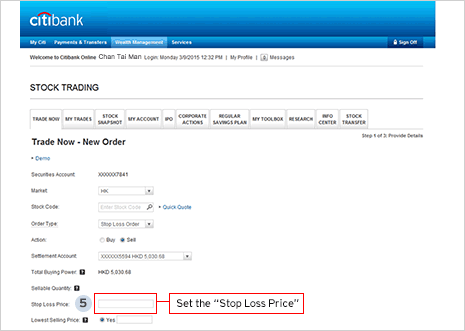 How to set the Stop Loss Order? Market Order is an order which customers do not specify the price. A Market Order that is entered into the trading system during the Continuous Trading Session will be executed at the current bid / ask price at the time when the order is processed. 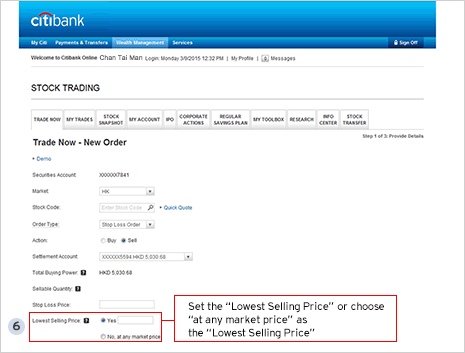 Upon customers' confirmation of any Market Order placement, the Bank will submit the buy / sell order to the market by matching it once up to 10 best price queues in the prevailing market and up to a maximum of 10 spreads above / below the nominal price at the time when the order is processed. Any unfilled quantity of the Market Order resulting from completion of the above procedure will be automatically cancelled at once. For a Market Order to buy shares, additional 10% buying power compared with current market price will be held in order to avoid insufficient funding from settlement account due to volatile market movement. If there is insufficient buying power (including additional 10% buying power) from your account, buy order will not be accepted. Customer has placed a Market Order to buy 50,000 shares of a stock. Assume that the prevailing nominal price of that stock is HK$5.00 with price spread of HK$0.01. The Bank will calculate the required transaction amount and trading related charges based on the 10 spreads above the nominal price of the stock (i.e. HK$5.10) and the sum will be withheld from the customer's available investment amount. The Bank will submit the order to the market for matching once up to the 10 best price queues at prices equal to or lower than the nominal price plus 10 spreads (i.e. HK$5.10). Transaction Result: The Market Order is fully executed by buying all 50,000 shares after matching with the 10 best price queues in the prevailing market. Transaction Result: The Market Order is only partially executed by buying a total of 41,000 shares after matching with the 10 best price queues in the prevailing market. The unfilled quantity of the order (i.e. 9,000 shares) will be automatically cancelled. Customer has placed a Market Order to sell 50,000 shares of a stock. Assume that the prevailing nominal price of that stock is HK$8.00 with price spread of HK$0.01. The Bank will submit the order to the market for matching once up to the 10 best price queues at prices equal to or higher than the nominal price minus 10 spreads (i.e. HK$7.90). Transaction Result: The Market Order is fully executed by selling all 50,000 shares after matching with the 10 best price queues in the prevailing market. Transaction Result: The Market Order is only partially executed by selling a total of 4,000 shares after matching with the 10 best price queues in the prevailing market. The unfilled quantity of the order (i.e. 46,000 shares) will be automatically cancelled. 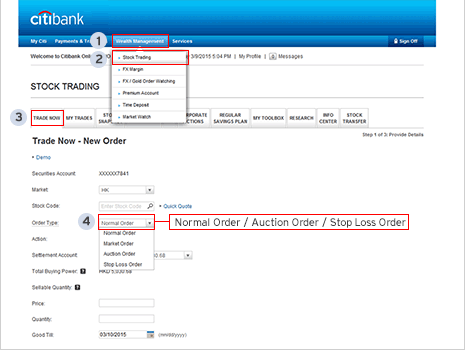 Enable you to set the order validity period for up to 4 trading days for normal order, at-auction limit order (Pre-opening session) and stop loss order. Within the good-till-date of a single good-till-date order, all the portion(s) thereof filled on any trading day shall be aggregated as one single order for that trading day for the purpose of calculating the fees and charges based on the normal fees and charges schedule and the executed price on that trading day. Citibank will not re-send buy/sell orders which are rejected by HKEX because of VCM or during closing auction session to market after end of cooling-off period or next trading day (Including Good-Till-Date Orders). How to set the Order Validity Date? During the 5-minute cooling-off period, the VCM security can continue trading but will only be allowed to trade within a fixed price band (±10% from the reference price). Price > Upper Price Limit 1. The buy/sell order (i.e. the incoming order) that triggered the VCM will be rejected by HKEX and no trade will be executed. price > upper price limit) which sent to HKEX and queued in the buy order queue will be cancelled. 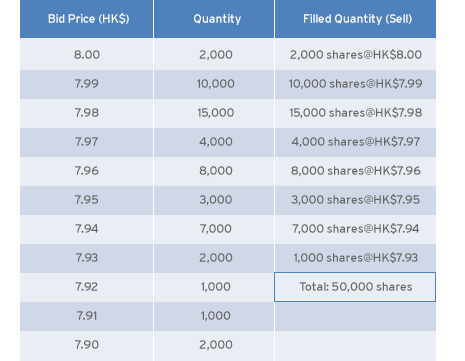 3.All the existing sell orders which sent to HKEX will remain in the order queue no matter if their prices are higher than the upper price limit, and will not be cancelled by HKEX. 4.Citibank will not re-send buy/sell orders which are rejected by HKEX because of VCM or during closing auction session to market after end of cooling-off period or next trading day (Including Good-Till-Date Orders). Price < Lower Price Limit 1. The buy/sell order (i.e. the incoming order) that triggered the VCM will be rejected by HKEX and no trade will be executed. price < lower price limit) which sent to HKEX and queued in the sell order queue will be cancelled. 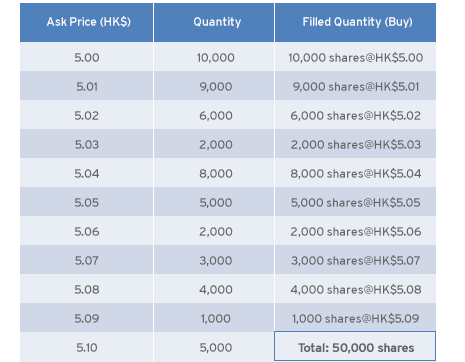 3.All the existing buy orders which sent to HKEX will remain in the order queue no matter if their prices are lower than the lower price limit and will not be cancelled by HKEX. Any incoming aggressive orders (i.e. buy order > upper price limit and sell order < lower price limit) outside the fixed price band will be rejected by HKEX immediately. You can now simply set up a regular savings plan for stock via Citibank® Online. With the regular savings plan, you could invest with as low as HK$1,000 per month to build a top-notch portfolio of shares in well-established Hong Kong companies. You can also enjoy the benefits of "Dollar-cost-averaging", which mean the average price of the stocks in your portfolio may be lower than the market price. After log on to Citibank® online, you can click "Wealth management>Stock trading>Regular savings plan" to set up a new plan. Citibank® Online is now enable you to submit one-time and setup permanent cash or scrip dividend instruction. 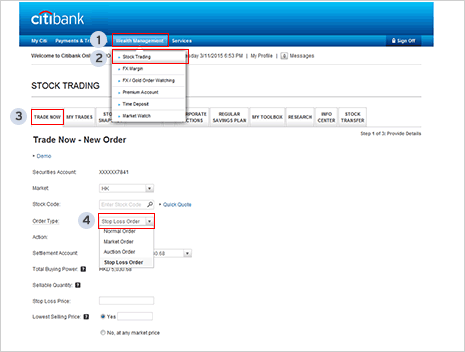 You can now transfer-in your stock holdings from other financial institution to Citibank® via Citibank® Online. 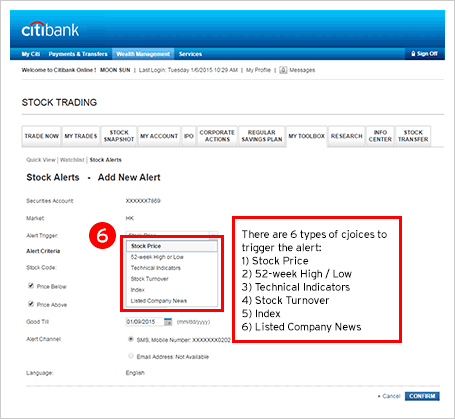 You are required to submit a transfer-out request to the institution that you want to transfer out the stock, and then log on to Citibank® Online and click "Wealth management>Stock trading>Stock transfer". The process takes around 3 days. Pick your ideal stocks using criteria such as industry, trading volume, P/E ratio, earnings per share, etc. Quickly locate targeted warrants using criteria such as stock code, expiry date and implied volatility. Help you check the order processing status in a timely way. *Monitor stock prices, the highest / lowest price over 52 weeks, stock turnover, and other criteria. You can choose to receive the alert messages via SMS or email. Track trading movement of significant investments by picking out stocks with large trade turnover. Compare the performance of stocks and indexes through plotting different charts. Leverage real-time local and international financial markets news from Dow Jones & Company Inc.
Access average stock purchase prices and keep track of your portfolio's performance. 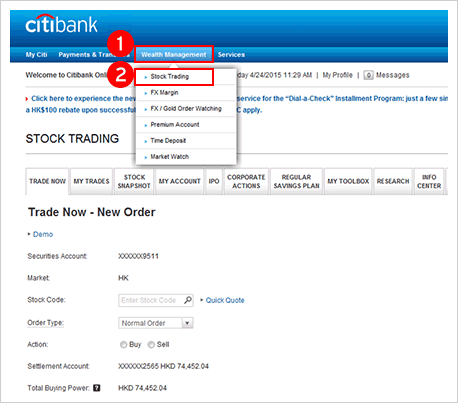 After log onto www.citibank.com.hk, click "Wealth Management" > "Stock Trading" > "IPO" > "Apply". Upon confirming the prospectus has been read and understood and completing the application form, click "CONFIRM" and "SUBMIT" to submit your application. Subject to service fees and charges. For details, please refer to the Service Fees and Charges leaflet. Logon to www.citibank.com.hk > Services > Investment Services > Apply for Securities Services. Complete 6 questions in the Suitability Questionnaire to ensure you are suitable to open a stock account, acceot the Terms and Conditions, and then verify details. Application comfirmed. Keep the "Application Reference Number" acknowledgement for future reference. 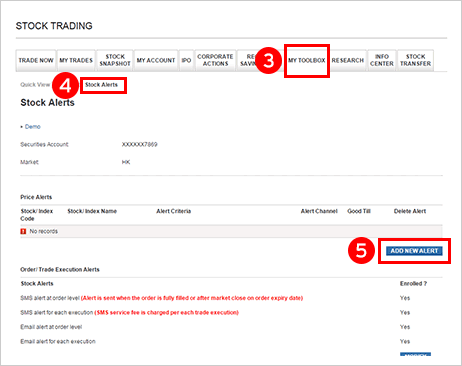 You can simply set up a price alert within 2 steps to monitor the market changes! Fill in all he required information and "Confirm"
You are also warmly welcome to open a stock account at any Citibank® branch. The "Payroll for continuous stock fee waiver" Program (the "Program") is only applicable to holders of a Step-Up Interest Account ("Payroll Clients"). Payroll Clients have to open a new securities account ("New Stock Clients") with Citibank (Hong Kong) Limited (the "Bank") from January 1, 2019 to June 30, 2019 (the "Promotion Period") and must not have cancelled or held any sole or joint securities account with the Bank within the past 12 months, in order to enjoy the Program. New Stock Clients can enjoy the Brokerage Fee Waiver within the first 3 calendar months of securities account opening. New Stock Clients have to deposit monthly salary of HK$15,000 or above into the Step-Up Interest Account via the auto payroll service or standing instructions from other banks ("Successful Payroll Deposit") from the 4th calendar month of securities account opening, and continue to have a Successful Payroll Deposit every month thereafter in order to enjoy the Brokerage Fee Waiver. E.g. A New Stock Client who opens a securities account within January 2019 has to have a Successful Payroll Deposit on or before April 30, 2019, and continue to have a Successful Payroll Deposit every month thereafter to enjoy the Brokerage Fee Waiver. From the 4th calendar month onwards, if there is no record of Successful Payroll Deposit or if the payroll account is cancelled in any single month, the "Payroll for continuous stock fee waiver" offer will be terminated in that month and cannot be resumed. New Stock Clients are required to pay the regular brokerage fees at the time of trading. The waived brokerage fee during the waiver period will be refunded to New Stock Clients' settlement account linked to the securities account within 3 months subsequent to the corresponding stock transaction month. New Stock Clients should maintain a valid securities account and settlement account at the time when the refund is made. The Program cannot be enjoyed together with "Up to a lifetime fee waiver on stock purchases" Program. The Program is not available to clients who are the employees of the Bank or Citibank N.A. or its subsidiaries during the Promotion Period. Illustration: A New Stock Client who opens a securities account on January 23, 2019, hence, January 2019 will be the 1st calendar month. Deposit monthly salary of HK$15,000 or above into the Step-Up Interest Account via the auto payroll service or standing instructions. From the 4th calendar month onwards, if there is no record of Successful Payroll Deposit or if the payroll account is cancelled in any single month, the "Payroll for continuous stock fee waiver" offer will be terminated in that month and cannot be resumed. Refund figures are based on an assumed brokerage fee of 0.2% of the trading turnover. The “Up to a lifetime fee waiver on stock purchases” Program (the “Program”) is only applicable to clients who do not have a Step-up Interest Account (“Non-payroll Clients”) with Citibank (Hong Kong) Limited (the “Bank”). Non-payroll Clients have to open a new securities account (“New Clients”) from January 1, 2019 to June 30, 2019 (the “Promotion Period”) and must not have cancelled or held any sole or joint securities account with the Bank within the past 12 months, in order to enjoy the Program. New Clients must have at least one Eligible Transaction* within the first 3 calendar months of securities account opening. E.g. New Client, who opens a securities account within January 2019, is required to conduct at least one buy or sell trade of Hong Kong stocks on or before March 31, 2019, in order to continue enjoying the Brokerage Fee Waiver in April 2019, the 4th calendar month of securities account opening (the "4th month"). Brokerage fee for all buy trades of Hong Kong stocks within the first 3 calendar months of securities account opening will be waived. Starting from the 4th month, the Brokerage Fee Waiver will continue if New Clients perform at least one Eligible Transaction in each calendar month thereafter. If New Clients do not conduct any Eligible Transaction in any month starting from the 4th month, the Brokerage Fee Waiver will be terminated starting from the following month and cannot be resumed. * Eligible Transaction refers to Hong Kong stock buy or sell transactions only. Buy and sell transactions of stock in other markets, stock transfer-in and transfer-out, Initial Public Offering, Stock Regular Savings Plan related transactions, are not considered as eligible transactions in the Program. New Clients are required to pay the regular brokerage fees at the time of trading. Each brokerage fee collected for every buy trade completed during the Promotion Period or within the first 3 calendar months of the securities account opening will be refunded to clients’ settlement account linked to the securities account within 3 months subsequent to the month of the relevant transaction. New Clients should maintain a valid securities account and settlement account at the time when the refund is made. The Program cannot be enjoyed together with the "Payroll for Continuous Stock Fee Waiver" Program. The Program is not available to clients who are the employees of the Bank or Citibank N.A. or its subsidiaries during the Promotion Period or at the time the brokerage refund is made. Illustration: A New Client who opens a securities account on January 23, 2019, hence, January 2019 will be the 1st calendar month. Condition 2: Starting from the 4th month, New Clients must have at least 1 Eligible Transaction* in each calendar month to continue the Brokerage Fee Waiver in the following month. Assuming the brokerage fee is 0.2% of the trading turnover; cells highlighted in grey indicate Eligible Transaction in the Program. Eligible Transaction refers to Hong Kong or US stock buy or sell transactions only. Buy and sell transactions of stock in other markets, stock transfer-in and transfer-out, Initial Public Offering, Stock Regular Savings Plan related transactions, are not considered as eligible transactions in the Program. If there is no Eligible Transaction, as stated above, within the first 3 calendar months of securities account opening, then the "Up to a lifetime fee waiver on stock purchases" program will be terminated in the 4th month and cannot be resumed. And if there is no Eligible Transaction in any month starting from the 4th calendar month, the Program will be terminated and cannot be resumed in the next month. The promotion is valid from April 1, 2019 to June 30, 2019 ("Promotion Period"), both dates inclusive. Clients must successfully transfer in HK/ US/ SH/ SZ stock from a third-party financial institution/ bank at a branch or via the "Stock Transfer" function on Citibank Online during the Promotion Period, to be eligible for the cash coupon rewards. The Total Stock Net Value is based on the multiple of the closing stock price* on the last trading day of the corresponding successful transfer-in month and number of shares. If a stock involves foreign currency, an exchange rate of USD1 = HKD7.8/RMB1 = HKD1.2 will be used for its stock value calculation. The stock transfer activities in a joint name stock account will be considered in the Total Stock Net Value calculation for the primary account holder. Each client can only enjoy the offer once during the promotion period. Cash coupons will be sent to eligible clients within 3 months upon the end of the Promotion Period. Clients should maintain a valid and same HK securities account from the time the stock transfer-in is performed to the time the cash coupons are received. Previous closing stock price is subject to Hong Kong Exchange (HKEx) adjustment. For details, please refer to the “Guidelines on Adjustments to the Previous Closing Price of a Security” published by HKEx. No Minimum Brokerage Fee Offer (the "No Minimum Brokerage Fee Offer") is valid until June 30, 2019. Citigold Private Clients, Citigold® services clients, Citi Priority® clients and Citibanking Citi At Work payroll clients who conduct HK stock transactions via Citibank Online or Citibank Mobile Securities Services will have the minimum brokerage fee (HKD/RMB100 per transaction) waived. The No Minimum Brokerage Fee Offer is not applicable to transactions conducted via the Dedicated Trading Hotline. Clients will still be charged non-brokerage fee items such as, but not limited to, Stamp Duty, Transaction Levy and Trading Fee where applicable. The Bank will credit the refund amount to a client's Hong Kong Dollar settlement account. If only a US Dollar/Renminbi (RMB) settlement account is linked to the securities account, the refund amount will be credited to that account. An exchange rate of USD1 = HKD7.8/RMB1 = HKD1.2 will be used for all calculations. Online IPO application handling fee waiver is valid until June 30, 2019. All the above offers cannot be used in conjunction with any other offers. All the above offers / rewards are not applicable to clients who are the employee of the Bank or Citibank N.A or its subsidiaries during the Promotion Period and at the time crediting the rewards. The Bank reserves the right to suspend, amend and terminate the offers and change the Terms and Conditions from time to time without prior notice. The Bank reserves the right of final decision in the event of dispute. In the event of discrepancy between the English and Chinese versions, the English version shall prevail. You should seek advice from your professional advisors as to your particular tax position, including but not limited to estate duty and withholding tax that might arise from investing in overseas products. This material is for information purposes only and is not intended to constitute any offer or solicitation or advice to buy or sell any security. Investments are not bank deposits and are not obligations of, guaranteed or insured by Citibank (Hong Kong) Limited, Citibank, N.A., Citigroup Inc. or any of its affiliates or subsidiaries, or by any local government or insurance agency, and involve risks, including the possible loss of the principal amount invested. Share prices may go down as well as up. Investment products are not available for U.S. persons and might only be applicable to limited jurisdiction. Any person considering an investment should seek independent advice on the suitability or otherwise of the particular investment.